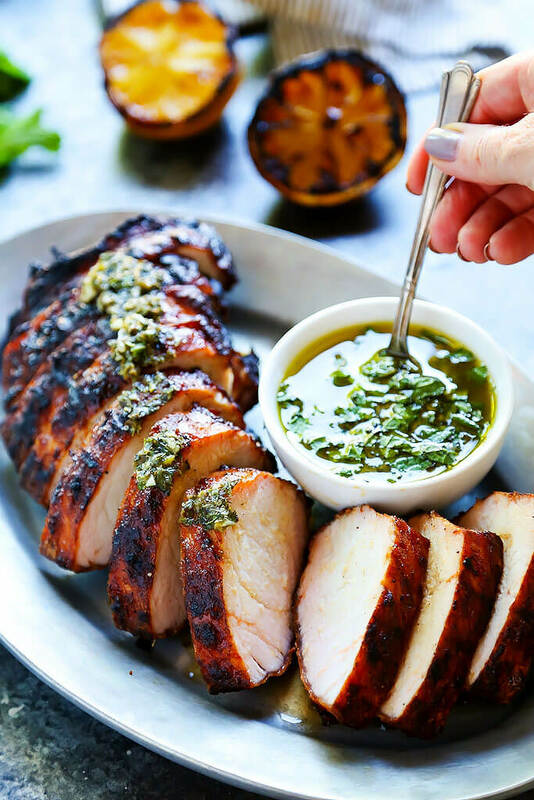 This Grilled Pork Tenderloin with Charred Lemon Chimichurri is the perfect quick dinner for hot summer nights! You can grill this beautiful dinner and prepare the amazing sauce in just 30 minutes. Hello Summer! Are you as excited as I am to throw open all the windows, let the fresh air in, turn on the grill and sip a glass of chilled wine (or two.. or three…) on the patio? I got so excited that I totally forgot that I’d already made a very similar version of this Grilled Pork Tenderloin with Charred Lemon Chimichurri just a few months ago. But, I promise you, there are some distinct differences. When I made a version of this dish in March, it was still pouring down buckets of rain here in Oregon. So, instead of grilling up my pork tenderloin outside, I sliced it into medallions and grilled it up indoors on my grill pan. While I loved the way that it turned out, and how quickly it finished cooking, there’s just something about grilling outdoors… For this recipe, I took a pork loin filet, left it whole, and threw that guy onto a hot grill. It developed the most amazing golden sear as it sizzled away and cooked to the perfect doneness in just 20 minutes (5 minutes per side). I used my new meat thermometer to ensure that it didn’t overcook – 140 degrees inside is just perfect – so it’s done inside but still juicy. And, be sure to let it rest for at least 10 minutes after it’s finished too – that’ll help those juices to redistribute, so they won’t come gushing out when you slice up the pork. I like to slice that grilled pork tenderloin into thick 1-inch slices. Yum! Why do charred lemons just sound so fantastic? It could be because that smoky, tangy combination is just perfection… They say that when you’re grilling you should have a bit of fat, a bit of acid, and a good hit of smokiness. This dish definitely has all that! This chimichurri is without all the heat of my mojo sauce – There are no spicy notes going on here. You’ll find more savory/umami notes in this chimichurri vs. my mojo sauce – Anchovies and capers lend their briny notes while the charred lemon gives it a great smokiness! 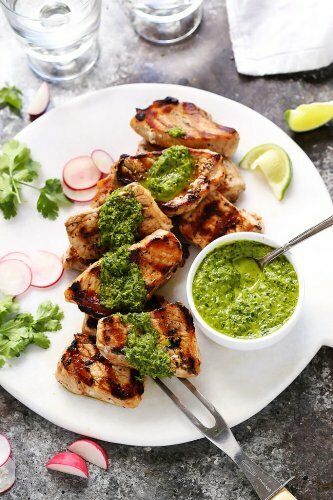 The herbs used in this chimichurri are more of the Argentenian variety – in particular, this chimichurri uses oregano and mint, while the mojo sauce has more of a Cuban influence and uses a blend of cilantro and parsley. The charred lemon chimichurri comes together in a flash! You can whip it up while your pork tenderloin is resting after being on that hot grill. Or, you can even make the chimichurri sauce ahead of time, just blend up all the ingredients and then add in the juice of that charred lemon when you’re ready to serve it up. That’s a perfect option for when you have company over because basically all of the work is done ahead of time – leaving you free to enjoy your guests and a glass (or two… or three…) of your favorite vino. Take the pork loin out of the refrigerator 30 minutes before cooking, to allow it to come to room temperature. Preheat your grill to 400 degrees for direct heat. Place your lemon, cut side down on the grill and allow it to get a good char on it. Once softened and browned, remove the lemon from grill and allow to cool slightly. Grill the pork loin for 5 minutes per side, until it reaches 140-degrees, about 20 minutes total. Remove from grill and let it rest for 10 minutes while you prepare the chimichurri. In a food processor or blender, add the oregano, mint, garlic, anchovy, and capers. Squeeze in the juice from the charred lemon halves and add the olive oil. Pulse until combined but not entirely smooth. 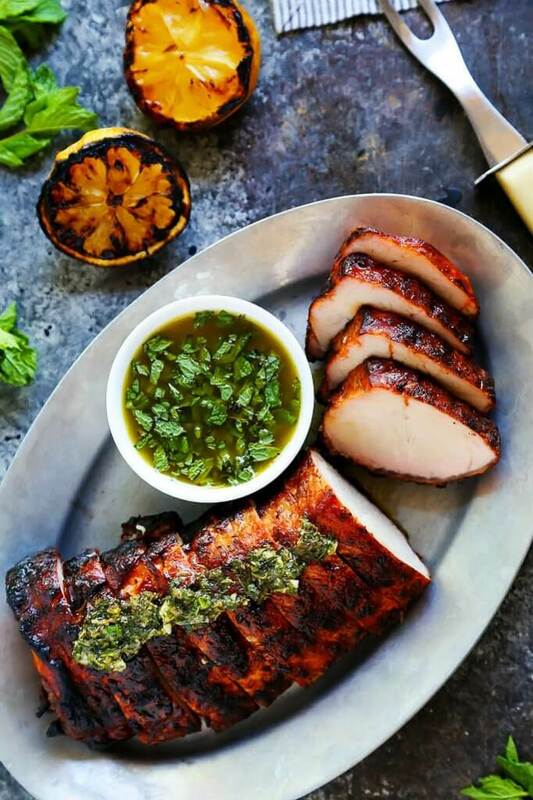 Slice the pork tenderloin and serve the charred lemon chimichurri drizzled on top with the remaining sauce served on the side. Sauvignon Blanc has bright citrus and herbal notes that pair nicely with the lemon and fresh oregano in the chimichurri sauce. For something unexpected and budget friendly, try a Vinho Verde. With a slight effervescence and good bit of citrus, it’s an amazing pairing. Looking for a red wine option? Try a Sangiovese. Its savory notes pair nicely with the grilled pork and fresh herbs. 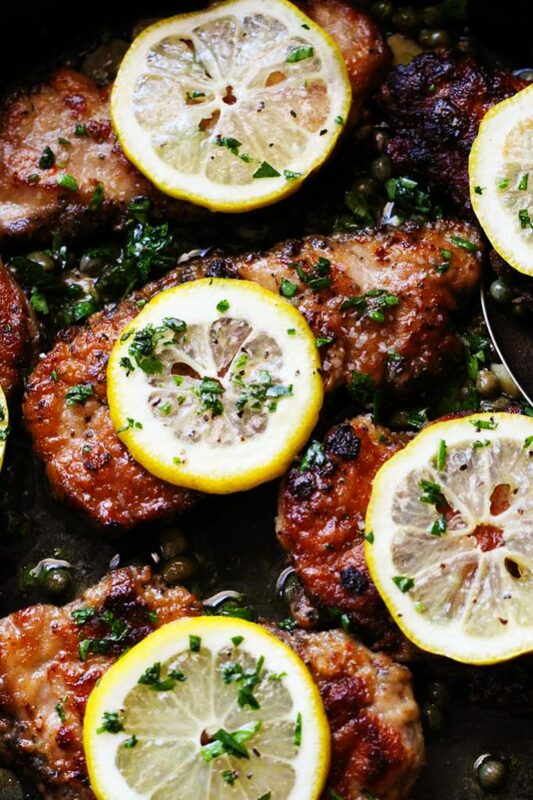 That charred lemon chimichurri sounds so amazing! I am in full grill mode right now with this beautiful weather! I love a fresh chimichurri to balance the smokiness from the grill. This is definitely going on my recipe list! 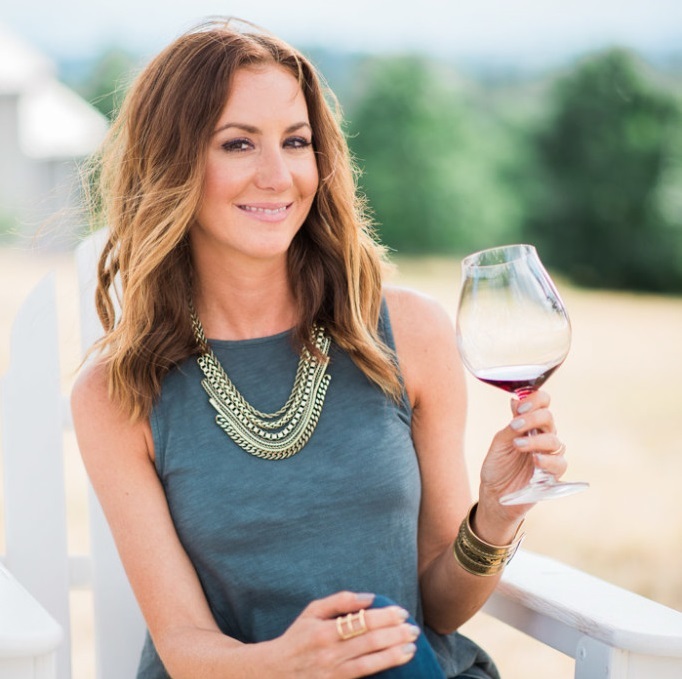 I’m right there with you – I love grilling on the patio with a glass of wine! Enjoy Hillary! The chimmichurri sauce looks mouth watering. Great pic. Thank you Jessica – Cheers! This is seriously one of the most gorgeous grilled pork items I’ve ever seen. I saw it in my facebook feed and saved it even though I have no idea what chimichurri tastes like! 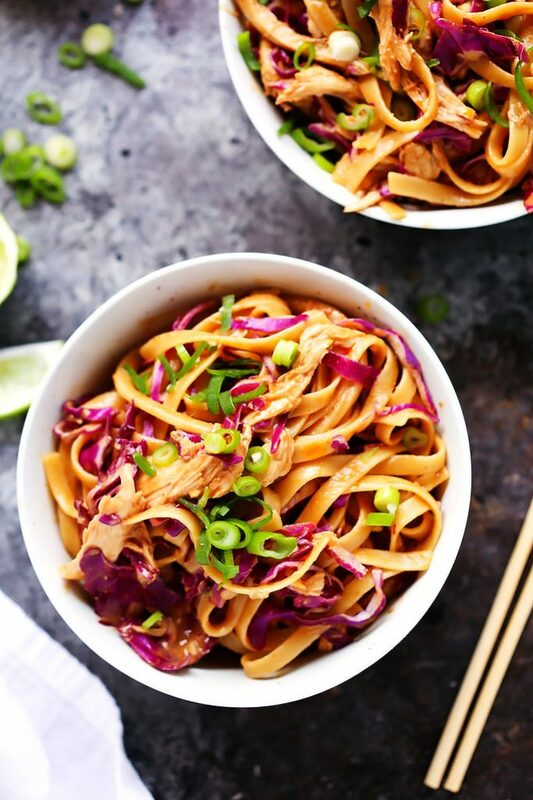 I am adding this to my dinner menu STAT. I’ve been absolutely allllll about chimichurri lately. But charred lemon? That is genius! 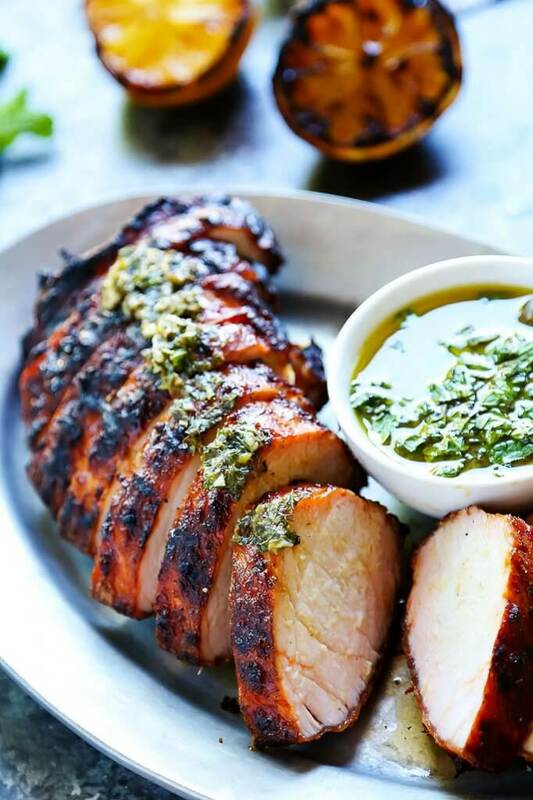 This pork looks perfectly grilled and I love that chimichurri! 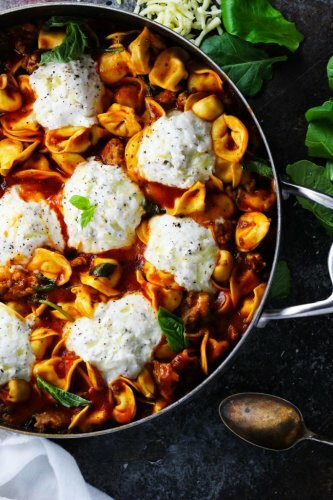 This would make a delicious a weekend lunch or dinner. Thanks Iryna – I’m a huge fan of the chimichurri sauce. It goes well on so many different dishes!